and the Water Regulations Northern Ireland. 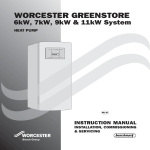 technical data such as measurements, wiring diagrams and installer menus. strength to carry at least 500 kg. Adjust the rubber feet so the heat pump does not lean. 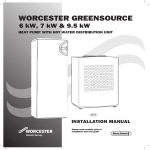 The temperature surrounding the heat pump should be between 0ºC and 35ºC. The task of the filters is to filter out dirt before it can enter the heat pump. Fit the filter for the collector circuit on the incoming pipe from the collector. Fit the filter for the primary circuit on the incoming pipe from the heating system. more about filling under the heading Connecting the heat pump to the heating system. expansion vessel hose to the expansion vessel. not be used for other purpose. The discharge pipework must be routed in accordance with part G3 of schedule 1 of the building Regulations. Turn off the main water supply to the cylinder. in order to reduce the pressure. on the hose, the higher the flow rate. Disconnect connection 4 - Domestic hot water out. Let the whole volume drain out. Normally there is no need for water treatment to prevent scale formation. prevention device. In such circumstances the advice of the local water authority should be sought. return pipe are often contaminated. 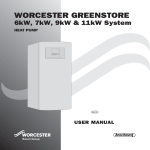 A wiring diagram is supplied with the heat pump. Is connected to terminal GT3 X on the terminal block. the fan-assisted radiators are opened fully. Set the temperature in the hot water cylinder. pressure checked and topped up if necessary. order for the anode to work. If an error occurs, an alarm is activated in the control unit. The filters may be concealed by insulation material or an enclosure. 1. When large amounts of hot water are used (e.g. Possible cause 2: Faulty electric anode. To reheat 70% of the tank volume to 60°C takes approx. 47 minutes.